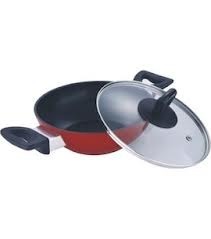 Innovative Kadai – 270 mm manufactured and exported by us come with a frying surface diameter of 270 mm. These are made from supreme quality aluminium that is processed in our state-of-the-art machineries. These products are widely appreciated for being innovative, cost effective and eco friendly. We provide these products as per international quality standards and at market competitive price. These can be used for preparing healthy and nutritious dishes.